Naomi and Daniel are Fun In the Sun Weddings’ newest newlyweds! Nobody knows the exact details of how the bride and groom got engaged. Naomi and Daniel had been dating an ‘appropriate’ amount of time when she began nudging him in the direction of marriage. So, when a summer festival in London was on their calendar, Daniel sprang into action, thinking the weekend away would be the perfect opportunity to propose to Naomi. He had to jump through hoops to get the engagement ring ready in time and then spent a very nervous train journey worrying about the ring tucked in his luggage up on the luggage rack. The day before the festival began, they wandered around London, shopping at Harrods and enjoying the city. Naomi hesitated outside a jewelry store and gave him the look. He gently led her away. She had no idea he was about to propose. Back at the hotel, Naomi found champagne chilling, and a new Michael Kors bag as a gift from Daniel. Naomi was on cloud nine as she went to freshen up for dinner. So as Naomi stepped out of the shower, happily toweling off, she said: “It’s been a perfect afternoon, all you need to do now Daniel, is ask me to marry you.” And he was down on one knee with the ring box in hand. 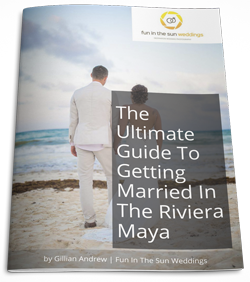 Fast forward to their destination wedding in Playa del Carmen at the Riu Palace Mexico, which was a great day enjoyed by all – aside from the July heat which nearly had guests passing out! 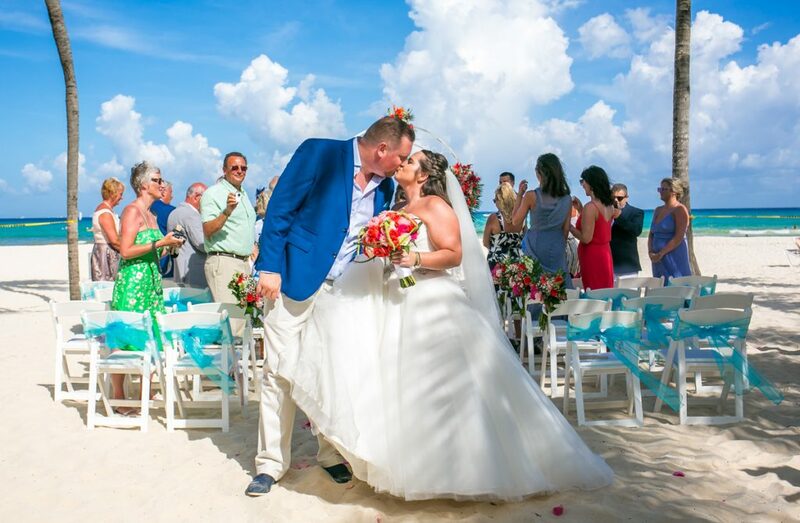 The bride and groom loved getting married on the beach and having hundreds of tourists watching them as they tied the knot. 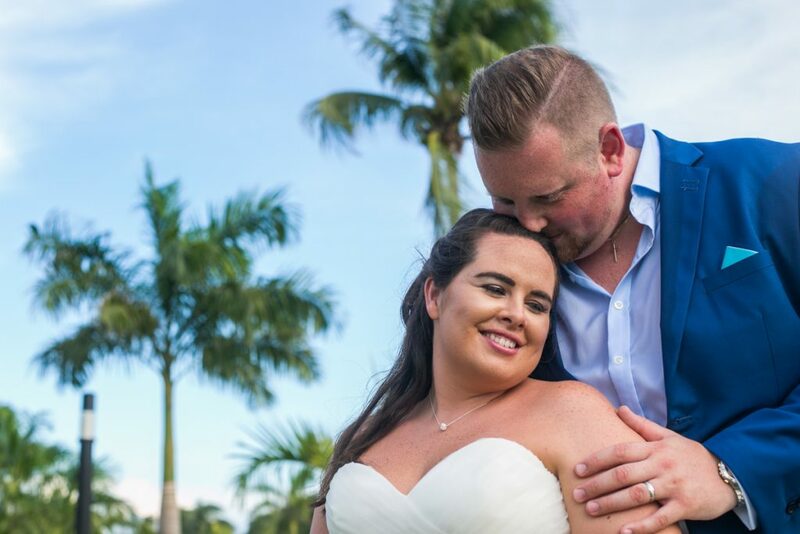 Naomi and Daniel, it has been such a pleasure sharing this special moment in your lives, and we wish you nothing but fun stories and adventure in your marriage. 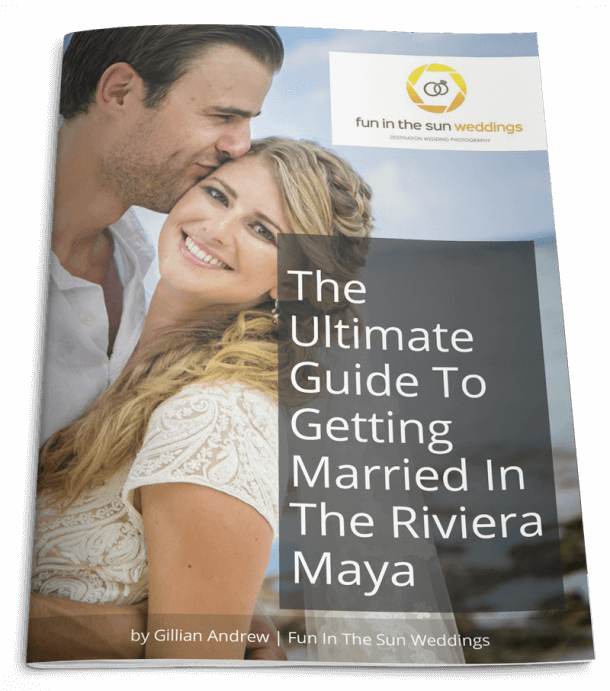 We can’t thank Gillian & Marc at Fun in the Sun Weddings more for all their help and advice in the planning in the run up to the big day.